Recently, I hired a German researcher to search the “Landeskirchlichen Archiv der Nordkirche” in Greifswald, Germany for me. I sent him a list of people and dates that I was interested in, and he returned from his trip with about 60 new records for my Kamrath and Pribbernow families. I will post a summary of the Pribbernow Family records here, and have posted the Kamrath family records separately. 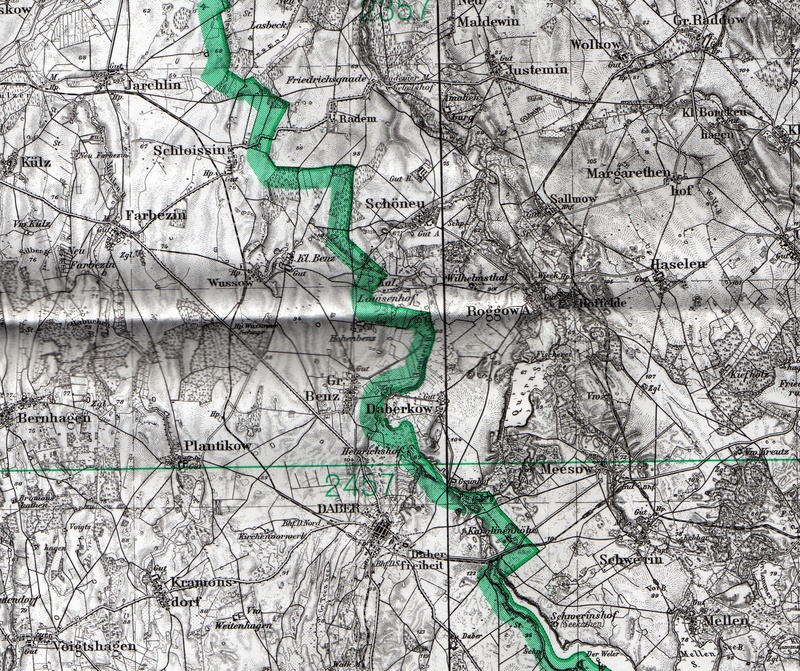 Both lines now go back much futher than before in Pomerania (Pommern) Prussia, and with much greater detail. I have put the digitized images of all these records on my tree at Ancestry.com. Hoffelde (Dargomyśl), Meesow (Mieszewo), Schwerin (Zwierzynek), Roggow A (Rogowo), Voigtshagen (Wojtaszyce), Gross Raddow (Radowo Wielkie), Gross Benz (Bienice), Schöneu (Sienno Dolne), and others. Friedrich Pribbernow Sr. (born about 1690) lived in Meesow, Kreis Regenwalde, Pommern, Prussia. Friedrich Pribbernow Jr., born on 20 Mar 17 Aug. 1717 in Meesow, baptized on 17 Aug 1717. (Roggow A, 1717). Erdmann Pribbernow (mentioned on another record). Anna Sophia Elisabeth Pribbernow (mentioned on another record). Marriage Record – Friedrich Pribbernow, farmhand in Meesow, married on 15 Jul 1745 Elisabeth Busse from Gross Benz. (Roggow A, 1745). Death Record – Friedrich Pribbernow, mayor and farmer in Meesow, age 72 years minus six months and six days, died on 11 Feb 1789 from old age and was buried on 14 Feb. 1789. (Roggow A, 1789). Christian Friedrich Pribbernow, born on 1 Jan 1769 in Meesow, baptized on 6 Jan 1769. Godparents: 1. Christ. Grunow, tenant in Louisenhof. 2. Christoph Busse, farmhand in Meesow. 3. Sophie Schmidt, maidservant in Kramonsdorf. (Roggow A, 1/1769). Michael Pribbenow’s wife died abt 1778. Unfortunately, a death entry could not be located. Marriage Record – Michael Pribbernow, farmer in Meesow, married on 24 Nov 1779 (Dorothea Sophia Busse) daughter of Christoph Busse, farmer in Meesow. (Roggow A, 2/1779). Brigitta Pribbernow, born on 19 Jan. 1785 in Meesow, baptized on 19 Jan. 1785. Godparents: 1. Ann Marie Busse. 2. Brigitta Busse. 3. Friedrich Wienke, farmer in Meesow. (Roggow A, 7/1785) Dorothea died shortly after baptism. Unnamed Son Pribbernow, born on 10 Nov 1837 in Meesow. (Roggow A, 61/1837). He died unbaptized on 1 Dec 1837 in Meesow. Recently, I hired a German researcher to search the “Landeskirchlichen Archiv der Nordkirche” in Greifswald, Germany for me. I sent him a list of people and dates that I was interested in, and he returned from his trip with about 60 new records for my Kamrath and Pribbernow families. I will post a summary of the Kamrath Family records here, and post the Pribbernow family records separately. Both lines now go back much futher than before in Pomerania (Pommern) Prussia, and with much greater detail. I have put the digitized images of all these records on my tree at Ancestry.com. This map shows the various towns that are listed in these records, including Hoffelde, Meesow, Schwerin, Roggow A, Voigtshagen, Gross Raddow, Gross Benz, Schöneu, and others. [My 4x great-grandfather] Michael Friedrich Kamrath (born about 1800) wasn’t from Schwerin, Kreis Regenwalde, Pommern, Prussia, but his wife Louise Magedanz came from there. Later he went to Meesow, and then to the town of Gross Raddow, whose parish records, unfortunately, were lost in the aftermath of WWII. For this reason it is unlikely we will find his death record or that of his wife Dorothea Louise Magedanz. Michael was listed at various points as a farmhand (1826), a local governor or mayor (1835) and a private tutor (1857). 1. Michael Friedrich Kamrath, farmhand in Schwerin, married Dorothea Louise Magedanz on 21 Nov 1826 in Schwerin. (Schwerin, 4/1826). 1.1.1. Auguste V Kamrath, born on 8 Jan 1858. 1.1.2. Otto Julius Hermann Kamrath, born on 9 Jul 1859. 1.1.4. Bertha Auguste Wilhelmine Kamrath, born on 3 Aug. 1864. Death Record – Wilhelmine Henriette Sophie Pribbernow married to the cartwright Kamrath, born in 1834, died on 24 Feb 1865 in Hoffelde of colic, age 30 years, 11 months, 14 days, buried on 28 Feb 1865. She left behind a widower and 3 children. (Roggow A, 4/1865). Marriage Record – Carl Friedrich Kamrath, cartwright in Hoffelde, age 34, widower, married on 16 Jun 1865 in Hoffelde, Augusta Henrietta Wilhelmina Sense from Meesow, age 24, daughter of Christian August Sense in Vogtshagen. (Roggow A, 13/1865). My cousin Doris Winkelmann Sonntag’s branch of the Winkelmann family was caught up in the expulsion of German-speaking Prussians from parts of the former Prussian Empire that had been returned to Poland after World War II. These are some of the stories from what her family went through. “My family had been living and farming in the town of Stieglitz [Kreis Czarnikau, Posen, Prussia] and the surrounding area since at least the 1870’s. They did not leave voluntarily. “The Expulsion” was the result of the Second World War and the subsequent Potsdam Agreement. Before World War II, East Prussia belonged to Germany. After the war the lands were redistributed by the Allies, and the end result was that nearly all Germans were expelled from these formerly German territories which now fell inside the borders of Poland. My mother, Herta Erna Meier, was from Niekosken (Niekursko, Poland today) near Schönlanke. She had to leave her home with her family in November 1946. My father, Otto Paul Winkelmann, was forced to leave nearby Stieglitz with his family in January, 1947. Both families had to travel on foot, with only a few belongings, to the railroad station at Schönlanke (Trzcianka, Poland today). From there they were taken by train to Dresden in Saxony and came to a resettlement camp. They called these refugees “Umsiedler” or “resettled” people. There were many such resettlement camps in Germany. From these camps, people were eventually relocated more permanently to cities and villages in Germany. My mother’s family ended up in a village near Leipzig, Germany, and my grandfather Hermann Winkelmann, after several temporary settlements, eventually settled in Groß Schönebeck about 40 miles north of Berlin, Germany. Some families remained in East Prussia. They had to accept Polish citizenship to do so, but later in the 1950s most were relocated to West Germany. My father Otto Paul Winkelmann had been a soldier in the German Army. When he was released from captivity after the war, nearly everyone he had ever known had already been relocated and he could not return to his home town of Stieglitz. He had to find his family.